Looking for a way to make the most of your limited space? Stackable storage may be the answer, a stylish and practical way to organise and revamp your home. There’s storage solutions for all different areas in your home, read below to find out what your options are when taking the plunge towards a more spacious and clutter free home. We all tend to fancy ourselves as a bit of a handyman from time to time which means we accrue tools and gadgets along the way. The garage is a perfect place to store these as we don’t want them lying around the house, especially if you have small children at home. A well organised garage may take time to create but will be well worth it when you can finally use the space for what it was intended and not a dumping ground for items that are not worthy of living in the house. Large flexible tubs are ideal for storing tools as they are durable and can handle a little wear and tear they also come with the option to add a lid which means you can stack them to further increase your space in the garage. Why not also try some overhead or on the wall storage for larger items such as bikes to really maximise what little space you have. We all know how it feels to try and squeeze just one more item of clothing into an already packed out wardrobe. It makes it impossible to browse freely at your options when choosing the perfect outfit but if you’re willing to take some time to re-organise your wardrobe just twice a year and invest in some stackable storage that doesn’t have to be the case. You can store your winter woolies in stackable plastic containers in the summer months which will give you so much extra room in your wardrobe for all your summer purchases. You could even seal your winter wardrobe in vacuum seal bags before placing in the containers meaning you can make even more room in your wardrobe. You can then stack the containers in the bottom of the wardrobe or place then under the bed- out of sight out of mind. You can spend hours tidying the kid’s play room, you blink and it’s a mess again. 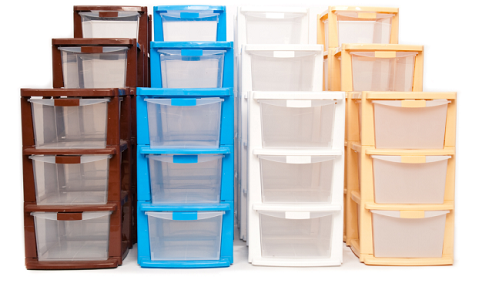 So with the summer holidays around the corner there’s never been a better time to reorganise the room and invest in some stackable storage- you’ll save hours in the long run! Why not get the kids involved in the big clear up too, they can choose where all their toys will be stored which will hopefully get them on board when it comes to tidying the room and putting everything back where it belongs. Stacked plastic draws are an ideal storage solution for playrooms and you could buy a set for each child, maybe they could also choose which colour they would like. Then once they’ve chosen where each of their toys will live they could also spend time creating and decorating labels for each draw so there cannot be any arguments about where each item belongs. All worth a try when it comes to keeping this room tidy. Whether you’re re-organising the whole house or just a few rooms the handy tips above have a huge impact when creating space and making your home more functional. So if you have a few hours or a few days to spare give them a go and reap the rewards of a clutter free house.